A new idea in hazing birds from busy airport flight paths includes the idea that birds can be warned when they’re in harms way. 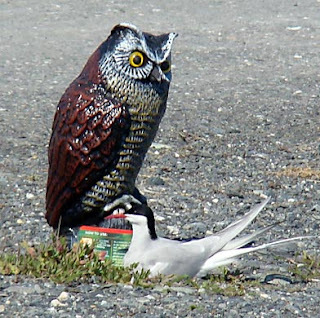 According to a recent NPR news report, some wildlife biologists are testing their theory by communicating with them visually. After US Airways jet hit geese after takeoff from a New York airport and made an emergency landing in the Hudson River in January, it turned spotlight on the high level of bird strikes. Airports try a lot of tricks to keep birds away, but now some researchers are shining light on a possible solution. At Plum Brook Station, a 6,000-acre, high-security government campus near Sandusky, Ohio, scientists are literally flying a plane at groups of geese and watching how they react. 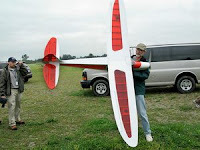 It’s a radio-controlled model plane — a 9-foot wingspan aircraft that looks like a miniature Cessna. It’s a phenomenon that others have investigated less formally. One effort mentioned in a National Transportation Safety Board report in May was by Qantas Airlines. The Australian carrier reported a 10- to 40-percent drop in bird strike rates after they mounted pulsating lights on their 737s.